Edmar Mednis (March 22, 1937–February 13, 2002), an American GM born in Latvia, moved to the US with his family at the end of WW2 where he trained as a chemical engineer but worked as a stockbroker and chess writer. I had the pleasure of meeting Mednis at the US Championship in 1971. I say pleasure because that’s what it was. I remember one day before the start of one of the rounds how a group of us were standing outside the tournament hall when Mednis, his wife and young daughter along with, if I remember correctly, Robert Byrne were entering the building. Mednis and Byrne stopped to greet us and while his daughter, perhaps 5 or 6, busied herself swinging on the step railings and his wife and Byrne stood by patiently, Mednis gladly engaged in conversation that ended up with him telling anecdotes of some of the players he had known. 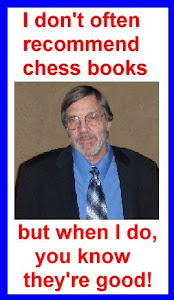 In this book he annotates 61 games that Fischer lost between 1958 and 1972. The annotations are mostly in the form of words with just enough variations give to illustrate the point. The focus is mostly on the critical point where Fischer played what Mednis considered to be the losing move. Mednis calls it "The Losing Moment" and explains why the move cost Fischer the game usually by concentrating on general principles which helps all us non-masters understand things a little better. Mednis also includes interesting tables that show Fischer’s wins and losses with the colors, who had the best records against Fischer, which countries had plus scores against him, categories on why Fischer lost and what opening he had the most problems against. Mednis also includes some anecdotes about Fischer which make interesting reading. There are two editions of this book. I have the edition written right after Fischer retired and Dover put out a second edition which includes games from the 1992 match with Spassky. This book was apparently good enough that in My Great Predecessors Kasparov quoted it on several occasions when discussing Fischer’s losses. Of course Kasparov, being a far better player than Mednis, punched some holes in Mednis’ analysis, but that doesn’t detract the book in the least in my opinion. I thoroughly enjoyed this book and can recommend it to anybody who is interested in Fischermania or just wants to play over games that are well-annotated without being bothered with slogging through line after line of analysis.